Linger was highly recommended by friends and websites so we knew that we needed to visit this restaurant with great food and views. Linger is known for their cool rooftop with the best view of Denver’s skyline. It is bittersweet that Denver is growing rapidly and therefore is constructing buildings left and right. This would include a building right in front of Linger’s most beloved view. Regardless, it is still an amazing rooftop with a nice view of Denver’s skyline. Besides their beloved view, Linger is also known for what the building used to be……an old mortuary, which was called Olinger. Owner/Chef Justin Cucci, has been very smart in his planning and execution – taking this old mortuary and turning it into this incredible restaurant while keeping some of its historical value, such as the name. 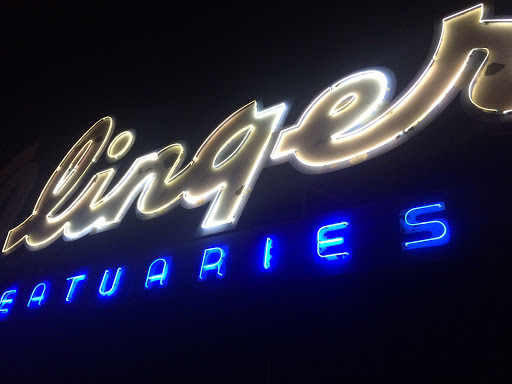 Linger is derived from the original name, Olinger, and the neon sign on the restaurant’s rooftop is the same sign that was used by the mortuary, but only the “linger” is lit up at night while the “O” is kept dark and “mortuaries” was changed to “eatuaries”. Absolutely brilliant and unique with the name because the food here literally lingers with guest’s taste buds while also remaining some of the building’s history. 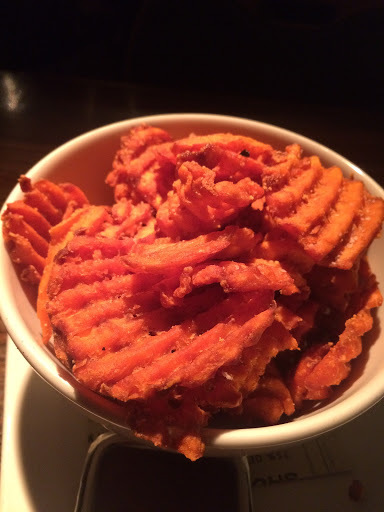 Linger is located in Highland, Denver and is the brainchild of owner/Chef Justin Cucci. The restaurant’s layout and design is one of the most creative and unique ones I have ever been to. Each room has a different setting establishing its own characteristics while still remaining cohesive to each room. The rooftop patio has an old RV as the bar and has become almost a signature of Linger. Guests can find little attributes to the old mortuary such as the embalming bottles used as the water bottles to refill glasses and the wine list is printed on old medical charts. They promise the embalming bottles are sanitized! Now let’s talk abut the food! Chef Justin created a beautiful, eclectic restaurant that embraces all cultures and food from all over the world. The restaurant provides guests with a world tour of street food with portions to be shared so that guests are able to have room to try food from almost every continent. 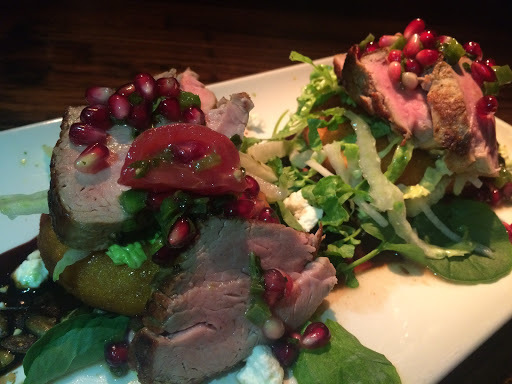 Showcased on the menu are Americas, Asia, Southeast Asia, Africa and the Middle East. Buns are also featured on the menu, though they are very good and popular they are not quite a country. Each region showcases street food known in the culture such as potstickers in Asia, BBQ tacos in the Americas, and hummus in Africa and the Middle East. Personally, I love this restaurant concept I think it is brilliant and I know I am not the only one who feels this way. Everything we ate was amazing and we did our best to “travel the world”. Our server, Sam, recommended the Sweet Potato Waffle Fries, Pork Tenderloin Pupusas, and Devils on Horseback and they were all amazing! Adam said that this was the first time he actually really enjoyed everything he ate. That’s a pretty big compliment! 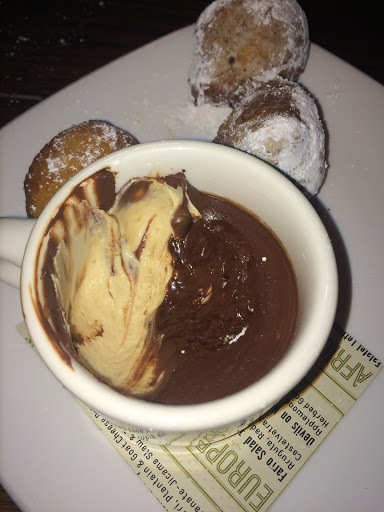 Now for our main attraction….Dessert! 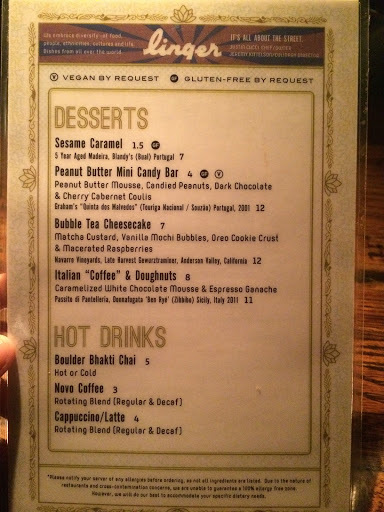 The dessert menu reflects the dinner menu. 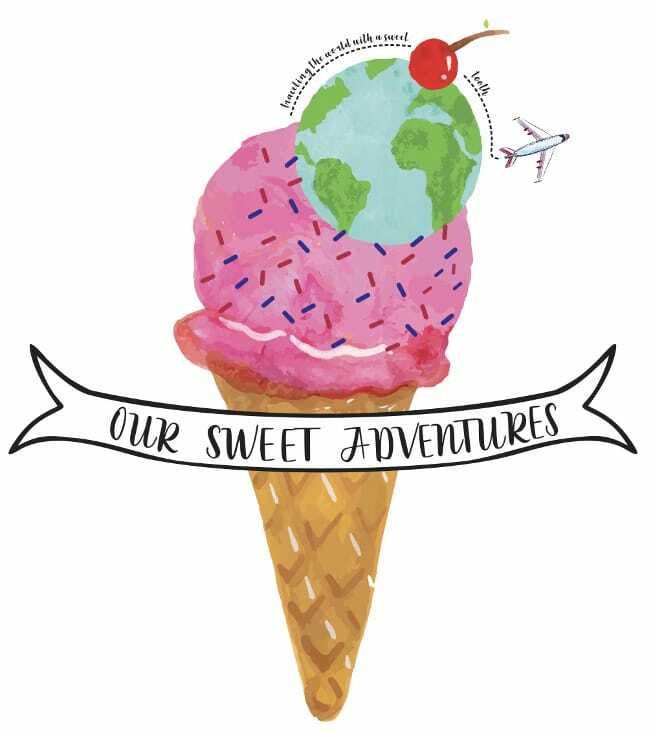 The desserts showcase different cultures as well, though they are not stated which countries, guests can assume influences from Asia (Bubble Tea Cheesecake), Europe (Italian “Coffee” & Doughnuts), Middle East (Sesame Caramel), Americas (Peanut Butter Mini Candy Bar) and Taiwanese Snow Ice. We opted for the Italian “Coffee” & Doughnuts because it was recommended by our server and she was already three for three. The desserts are prepared by Chef Lauren Seibert, and she oversees pastry for Chef Justin’s other restaurants, Ophelia’s and Root Down, as well. 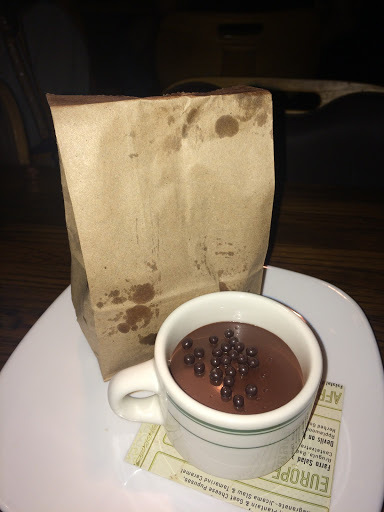 The presentation is fun and gives guest an interactive experience making this dessert amazing without even taking a first bite. The doughnuts are placed in a brown paper bag and then guests are to shake the bag to powder the doughnuts with sugar. The “coffee” part is a caramelized white chocolate mousse with an espresso ganache presented in a coffee mug. The caramelized white chocolate mousse is the best component of this dessert. It is light, creamy, and the caramelization of the white chocolate mousse comes through in a nutty, toasted flavor, similar to dulcey chocolate. The espresso ganache is bitter and bold, but combined with the caramelized white chocolate mousse it settles the strong flavors and balances out nicely. 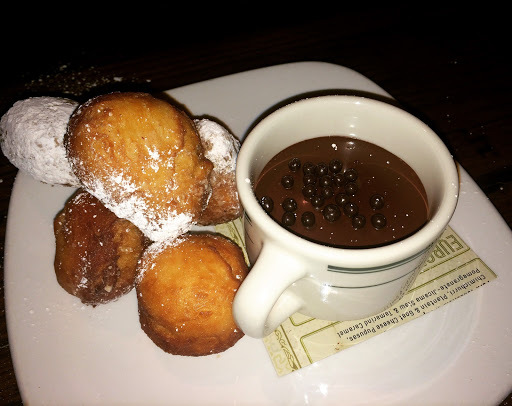 The doughnuts are soft and naturally sweet, and the powdered sugar definitely enhances its sweetness. The lightness of the doughnuts are also satisfying alongside its rich counterpart. All in all this dessert is a great balance and end to dinner that elects everything Linger stands for – fun, eclectic, engaging and great flavors. Great stuff here. We really enjoy the Denver-centric posts especially; they really are one of a kind. The information and the detail were just perfect. I think that your perspective is deep, its just well thought out and really fantastic to see someone who knows how to put these thoughts down so well. Great job on this. Thank you for your kind words, they are very appreciated. I am happy to hear you enjoyed the post felt what I was trying to capture. 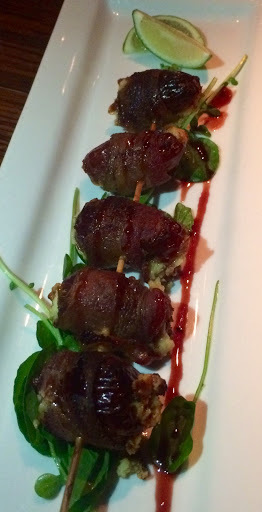 Linger remains one of our favorite restaurants we have ever dined at!